Marina Bay is one of the iconic attractions in Singapore which truly represents its fast-paced development as a modern city-state. The entire region of Marina Bay has seen the significant transformation and it is a de facto of Singapore. 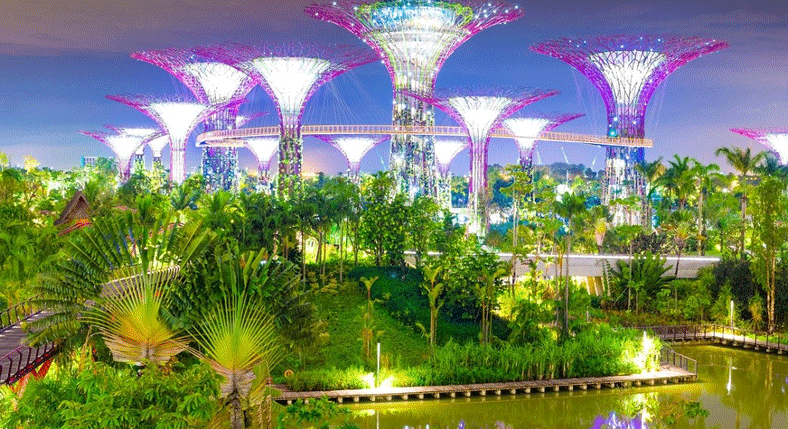 There are several amazing things to see and do in this S$5.5 billion complex. The list of best tourist attractions would definitely not complete without the well-known Merlion, the mythical symbol of Singapore. Along with beautiful things to see, Marina Bay Sands is full of fun for visitors who flock to Singapore every year. Gardens by the Bay seem to be inspired from a sci-fi movie which features the huge artificial tree structures (the Supertree Grove) which can be visible afar. 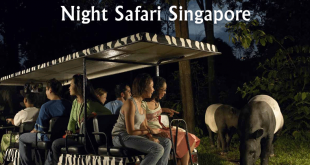 This attraction in Singapore has won a lot of awards and it constantly wows the tourists who can get up close with the trees through the amazing skywalk around the gardens. The 50m tall trees are illuminated beautifully at night with a kaleidoscope of vivid colors and the park looks even more beautiful. The light show starts at 20:00 and is absolutely free (except fee for Skywalk). Usually, arts and science museums are only attractive from the inside, i.e. the interiors and exhibits. But the ArtScience Museum is attractive also from outside. It is truly a landmark in its own and stands proudly at Marina Bay. Its unique lotus flower design is stunning and can be seen from afar. Along with its spectacular architecture, this superlative structure is also famous for impressive interiors. It is stretched over 50,000 sq. ft. and has 20 art galleries showing everything historical and creative in Singapore. However, exhibitions change from time to time. Located at the topmost of the three-pronged, awe-inspiring Marina Bay Sands, the Sands SkyPark is the best attraction to witness the iconic skyline of this island city-state in its glory. Entry fee is around S$23 (S$12 for kids). You can also enjoy some similar views at the CE LA VI Skybar or the lavish Sky@57 restaurant. Both of these are located similarly atop the Marina Bay Sands resort. 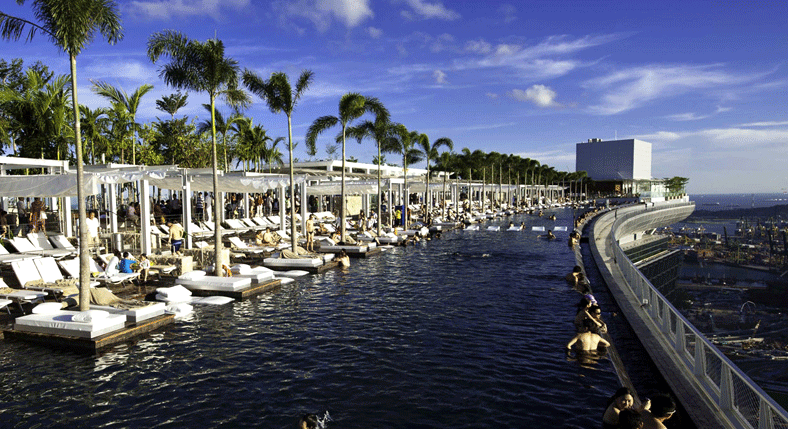 You may have definitely seen the picture of the amazing infinity-edge swimming pool on the Singapore postcards. It is reserved for guests only, who are staying at the hotel. 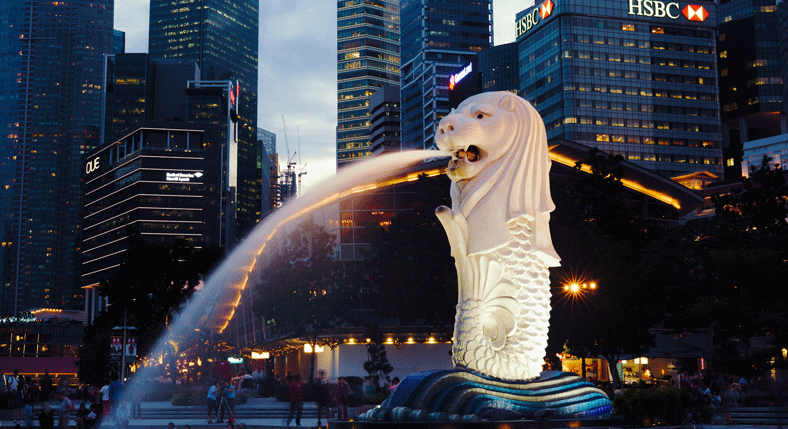 The Merlion is more than just an ordinary statue which welcomes visitors all day and every day. It is a mythical face of Singapore made of 70-tonne solid concrete which spouts water. It is a half mermaid and half lion statue. It is one of the most anticipated photogenic opportunities for visitors here. 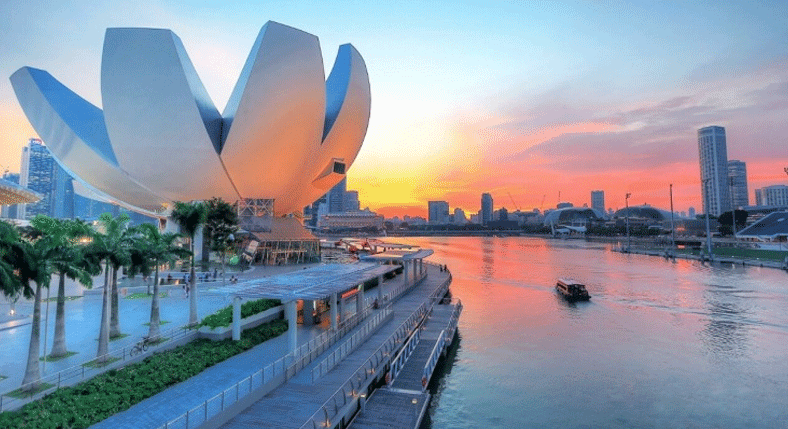 The iconic statue of Merlion is the main center of attraction here but you shouldn’t overlook its beautiful terraced seating area where you can relax and chill out for free and soak in the view or have some chilled beer at night. It also has a well-designed jetty around the water giving a great platform to capture the Merilion or the rest of the stunning scenery of the Marina Bay. 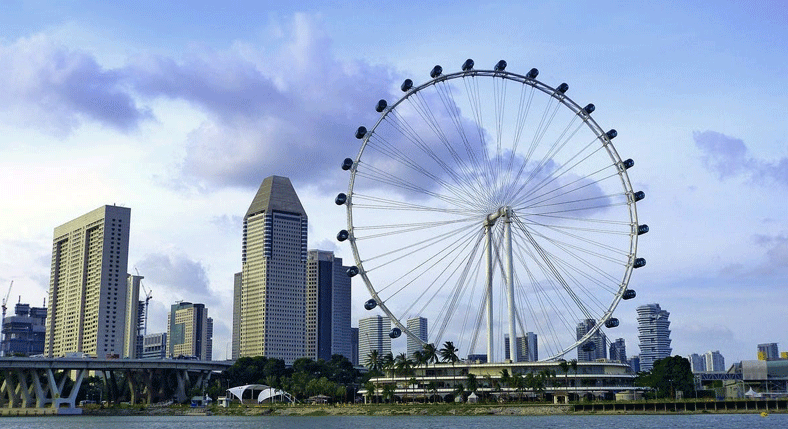 One of the largest observatory wheels in the world, the Singapore Flyer is the best way to observe the 360-degree view of the stunning city skyline. It makes a giant circular shape with 165m diameter. You can get some stunning views around 165m into the sky when making way around the loop at 0.21m per second of a leisurely pace. You can capture the well-known sights like Raffles Place, Singapore River, the CBD and Marina Bay at the air-conditioned capsule, which has space for 28 passengers. 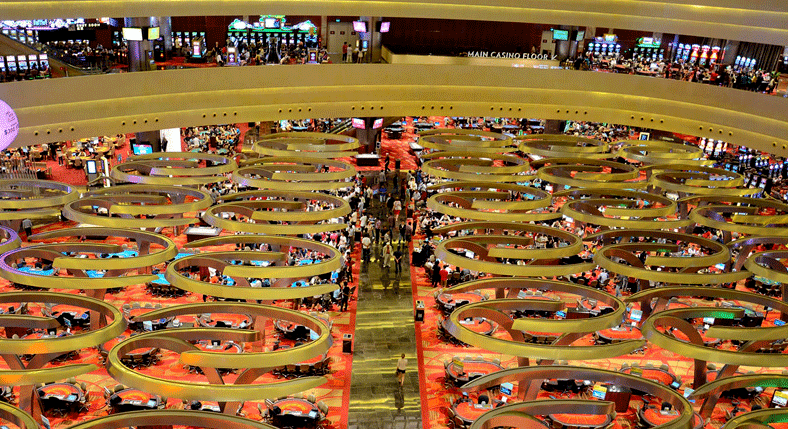 This 15000m giant casino belongs to the Marina Bay Sands Hotel since 2012. There are a whopping 1600 slot machines, 500 casino tables, a huge chandelier of 7 tonnes made of 130,000 Swarovski crystals inside the casino. 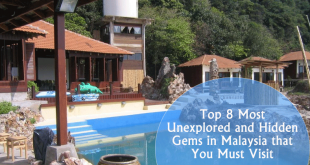 This amazing attraction is not all about gambling where you just throw away your savings or win big. In fact, most of the tourists visit here to witness the intense action of betting (especially in blackjack and poker). You may also play small games for 5¢ to 20¢ for fun. 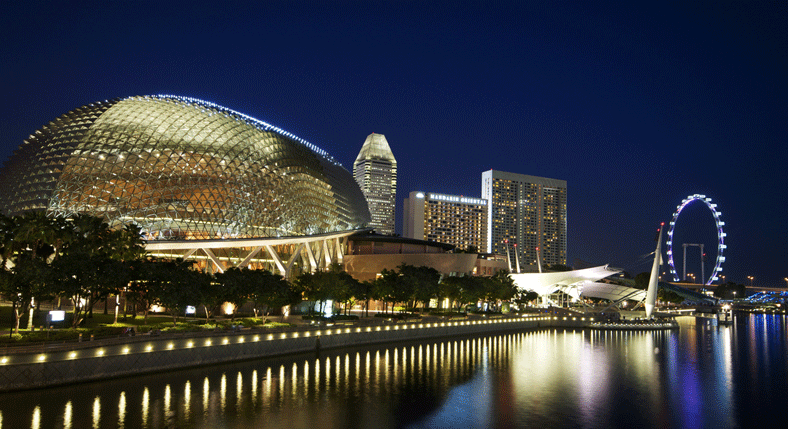 Esplanade – Theatres on the Bay is a huge cultural and art center which houses a separate theatre, concert hall, and outdoor performance venue. This multipurpose venue hosts a huge range of international and local music concerts, live shows, and cultural displays. If you feel that Singapore is eventually lacking in culture, you should definitely visit this amazing venue. It also hosts free events for the whole family. 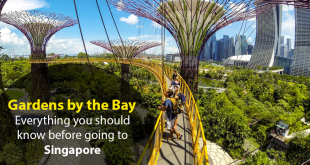 You can take MRT to Esplanade Circle Line Station or City Hall and take a quick walk to Esplanade – Theatres on the Bay. It is well known for huge glass and aluminum domes on the riverfront. 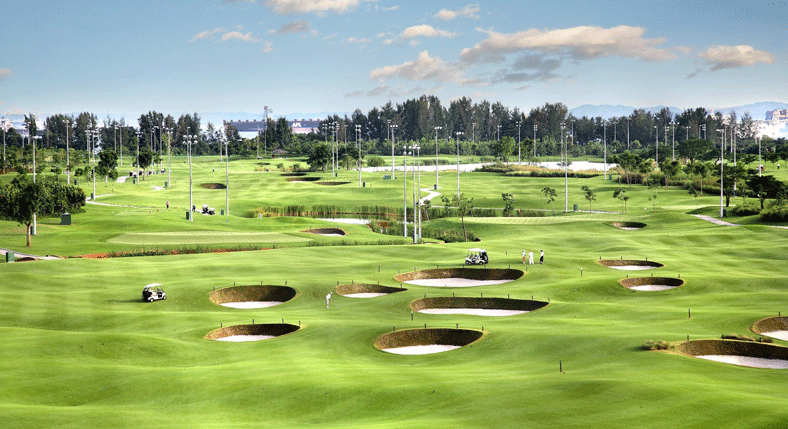 The first ever 18-hole golf course in Singapore, the Marina Bay Golf Course is open to the public now. It hosts some amazing facilities and different fairways. It is a true delight with breathtaking views of vast Marina Bay and Singapore skyline. There is also putting green and driving range to improve your skills and a range of well-placed bunkers and tricky water traps. The main course has over 18 holes. 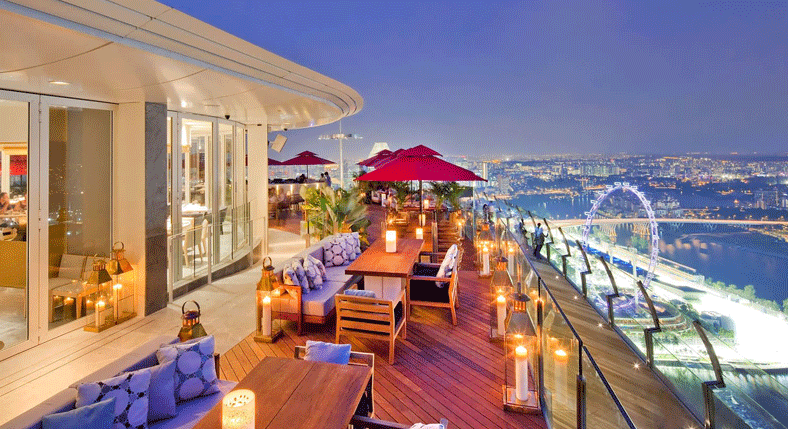 Once known as KU DE TA, CE LA VI has one of the stunning views of Singapore. It offers breathtaking views of the Marina Bay and the city’s skyline on the 57th floor of Marina Bay Sands. The cost of a cocktail is around the same as an entry to the observation deck at Marina Bay Sands. CE LA VI has quickly become one of the hottest favorite rooftop venues. If you haven’t managed to stay at Marina Bay Sands hotel, you can enjoy a bit of luxury while having a few drinks at CE LA VI Singapore.